In many countries, public awareness campaigns have taken place to educate the general public on SMS based fraud. 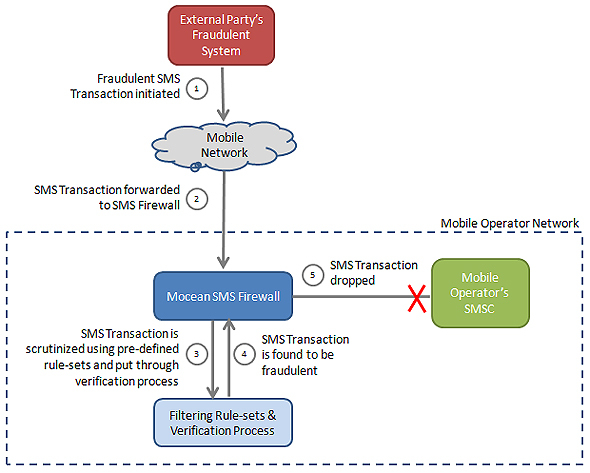 However as targeted SMS fraud on Mobile Operators involves mobile network manipulation, a technical solution needs to be looked into by Mobile Operators. Mocean SMS Firewall provides Mobile Operators a solution to regain control over SMS revenue leakages. Mocean SMS Firewall allows Mobile Operator to block Spammers easily! Mocean SMS Firewall allows Mobile Operators to identify flooding pattern and block the transactions automatically! Mocean SMS Firewall allows Mobile Operators to identify the fake transactions and reject it before any harm is done! Mocean SMS Firewall allows Mobile Operators to block spoofed transactions being terminated in the network! Mocean SMS Firewall alerts Mobile Operators of potential GT Scanning activities for further action! Mocean SMS Firewall provides Mobile Operators the peace of mind by providing a solution to all the key SMS revenue leakage causes listed above. Contact us now to find out more about our SMS Firewall solution. Let Mocean SMS Firewall assist you in assuring your SMS revenues today!